The Lishui Geological Prospecting Team of Zhejiang Province reported that numerous dinosaur egg fossils from the Cretaceous were discovered at a construction site at the foot of Baiyun Mountain in northern Lishui City. More than one hundred egg fossils were found in the purple rocks, dispersed amongst different nests. Each nest contained between five to seven eggs, with many eggs being recovered from outside of the nests. 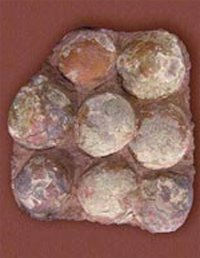 The large (10-16 cm) eggs are ellipsoid and spheroid in shape with one to three millimeter thick shells. In 1958 farmers had previously found the skeletal remains of dinosaurs in the same region. More recently the remains of sauropod dinosaurs were discovered during the construction of the Jinhua-Wenzhou Expressway.